Leading Supplier and Manufacturer from Thane, our product range includes IR & FTIR Accessories such as KBR Press, KBr Dies, Dry Box and Polished And Unpolished Crystals. We are looking for Export queries mainly from Canada, USA, South Africa, Middle East country, UAE, Philippine, Singapore, Thailand, Indonesia and from European Countries. 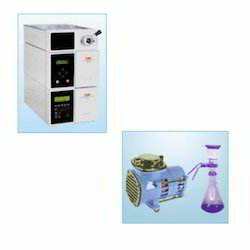 We provide quality HPLC and Accessories for manufacturing uniform pellet for solid sampling. It comprises of an isocratic pump which is a dual piston pump. Chromatography takes place in the computer monitor. It consists of a different range of wavelengths. Columns are available as per client’s requirements. Looking for IR & FTIR Accessories ?